Microsoft is constantly making changes to how things work in Windows (and then not really telling anyone about them). I spend a lot of time at the command prompt because it’s faster and easier than trying to wade through the GUI to perform many tasks. In fact, it’s because I spend all of this time at the command prompt that I wrote both Administering Windows Server 2008 Server Core and Windows Command-Line Administration Instant Reference. This new entry will also show up when you run command line utilities, such as TaskList. 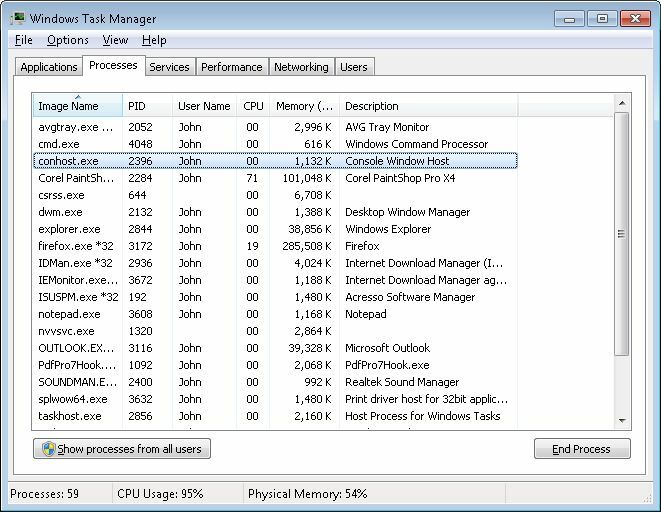 What this means is that when working with Windows 7, you need to account for ConHost.EXE in any scripts you create and be aware of the effect of this new service on your code. The use of ConHost.EXE does indeed make things a lot more secure. It also makes it possible to debug the internals of console applications with greater ease when you’re using a low-level debugger (see Inside Windows Debugging, written by Tarik Soulami, a book I’m currently technically editing for details). In short, this is a better, but different way to do things. I’d like to provide a special thank you to Tarik for the insights he provided for this post. Please contact me at John@JohnMuellerBooks.com for any questions you might have about ConHost.EXE.